(Nanowerk News) Jawbone® today announced UP, a new wristband and app system that helps you discover things about yourself that you never knew. UP tracks how you sleep, move, and eat, and gives you personalized insights to help you make smarter choices to feel your best. Sleep: UP employs a revolutionary sleep tracking system. Sophisticated motion-sensing technology tracks micro-movements of your wrist to deliver unprecedented detail including how long it took you to fall asleep, how much light vs. deep sleep you got, how long you were in bed and how many times you woke up during the night. By using the new Power Nap feature or setting the silent Smart Alarm, UP wakes you at the most optimal point in your sleep cycle so you wake up feeling refreshed and alert. Move: UP gives you comprehensive information about how you move throughout the day, including active vs. idle time, intensity of movement, total steps, distance, and calories burned. UP also vibrates gently to remind you to get up and move when you’ve been inactive for a specified amount of time. Eat: UP helps you understand more about your food choices. Simply take a photo of your food to create a visual journal, or go deeper by scanning a barcode or searching the database for more complete nutritional information. Mood: UP lets you keep track of how you feel throughout the day so you can correlate how your sleep, movement and eating affect your mood. Insights: UP analyzes your data to deliver highly personalized insights. It reveals connections between different elements of your life, shows how you compare to others, and educates with new information that’s tailored for you. The more you use UP, the more powerful the insights will become. UP is a sophisticated computer wrapped comfortably around your wrist and built to withstand everyday life. Encased in a smooth, hypoallergenic, medical-grade rubber, UP is shower- and splash-resistant so that you can wear it all day and night. With up to ten days of battery life you rarely have to take it off to charge. “The UP band is powered by the patented MotionX® engine which encapsulates years of technology development and innovation on the biomechanics of natural human motion. The accuracy and power efficiency of MotionX has been critical in enabling UP to deliver a 24/7 product experience,” said Philippe Kahn, CEO and founder of Fullpower, developer of the MotionX technology. 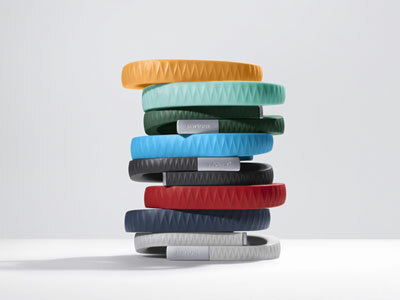 The UP band comes in three sizes (Small, Medium, and Large) and eight colors (Onyx, Mint Green, Light Grey, Blue, Navy Blue, Red, Orange, Hunter Green), and will be available for $129.99 at Jawbone.com, Apple, AT&T, and Best Buy nationwide beginning November 13.